The Bayerische Flugzeugwerke 109, is sometimes called the ME 109, after the designer Willy Messerschmitt. He was actually a designer at Bayerische Flugzeuwerke in the early 1930s. The BF 109 was the Luftwaffe's epee to the saber that was the Focke-Wulf 190. Most of the high scoring aces of the Luftwaffe flew in BF 109s, even when given the chance to switch to the FW 190. The choice for a contract as the newest Luftwaffe fighter for the BF 109 was not a done deal. As a matter of fact Field Marshal Milch, a high ranking Luftwaffe officer, had a long standing feud with Messerschmitt and his designs. One of Milch's closest friends was killed in an accident flying an early model of an older Messerschmitt design. Milch always held Messerschmitt responsible. The book shows that the fighter BF 109 was derived from the sport plane BF 108. Oddly enough, in warplanes at the time, the Supermarine Spitfire was designed right around the same time, and both planes' lifespan continued throughout the war and beyond. This shows how well made and upgradable the two designs were. 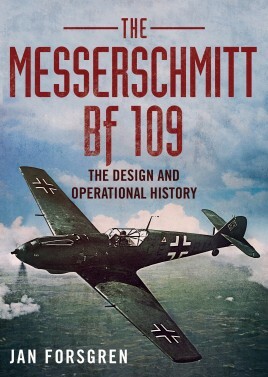 The author goes into all of the different versions of the BF 109, from describing the fate of all of the different test frames to the BF 109 Kurfurst, ME 209, and the ME 309. A unarmed and specially fitted BF 109 actually held the world speed record for over thirty years. He also doesn't shy away from all of the BF 109's faults. Although a great fighter, it was a difficult plane to master. Take offs and landings were especially dangerous. One of the BF 109's points in its favor was also its greatest flaw. The landing gear were attached to the fuselage and not the wings. This made replacing the wings, if damaged, relatively easy. However, that made the landing gear very narrow and was hard to taxi while on the ground. The plane also had a tendency to drop one wing when getting close to stall speed in landing, and it came with a real chance of doing a ground loop when taking off. The very narrow landing gear made both habits even worse. In this it should be equated with another excellent fighter, the US Corsair, nicknamed the 'Ensign killer'. Both were spectacular fighters, but both also needed to be flown by a skilled and alert pilot or disaster would ensue. Many BF 109s were damaged or destroyed before their pilots learned their temperament. Some planes are known for their docile flight characteristics; the BF 109 was not one of them. Many fighter pilots prefer a 'twitchy' fighter plane that needs constant attention than docility. For other examples, see the Sopwith Camel and the Fokker DR.1. Mr. Forsgren goes into every detail of the BF 109 from its inception to the last flights. The constant upgrading of the plane is shown as well as the attempts to make a Jabo (fighter bomber ground attack plane) out of it. The various upgrades in weapons from two small machine guns to the thirty millimeter cannon on some of the later models is shown. The author also goes into its use in the other Axis countries during the war, and its surprising appearance as a fighter used by Israel in its earliest battles. The book also comes with various tables and 120 pictures of the aircraft and different close ups of various parts of the designs. I can easily recommend the book to a newbie who is just starting to learn about the BF 109, but the book is also full of facts for the aficionados of the plane. As a matter of fact I liked the book so much, I am looking to get my hands on the author's book on the Ju-52. The Junkers 'Tante ju" has always interested me.